Johanna Harvey is the co-owner and general manager of Tesoro Restaurant and Pizzeria in Bangor, which just reopened. 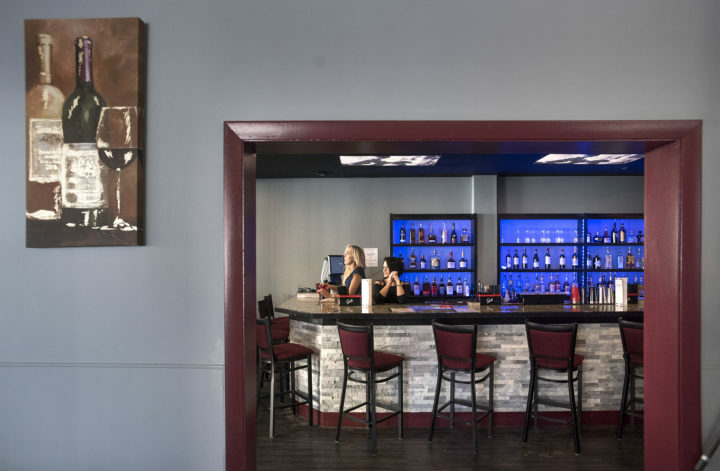 Let’s get some initial questions about Tesoro, the newly revamped Italian eatery on Harlow Street in Bangor that reopened under new ownership this week after three months closed, out of the way first. Yes, it still offers pizza, pasta and carafes of wine. Yes, there’s still classic diner-style seating in the front room. And yes, nearly 25 years after original owners Rocco and Fortunata Agrusa first opened the downtown Bangor restaurant, Tesoro will for the first time take credit and debit cards. Aside from that, there’s lots that’s new about Tesoro 2.0 — from the newly constructed bar offering classic and signature cocktails, to a new appetizer and salad menu, to a large, colorful mural painted along a wall by local artist Valerie Wallace. Johanna Harvey and her co-owner purchased Tesoro from the Agrusas in late November, and have spent the past three months renovating the eatery at the corner of Harlow and Franklin streets into a space that combines the retro pizza parlor feel of the old Tesoro with a sleek, modern trattoria look and updated menu. The interior has been fully renovated, from the floors and walls to the tables and chairs — but the retro-style blinds on the windows, the takeout counter and the hulking pizza oven remain in place. Tesoro Restaurant and Pizzeria in Bangor reopened this week. Harvey, 27, a UMaine alumna and a veteran of the Bangor-area dining scene, calls the new Tesoro an “upscale casual” restaurant. Chef Zac Quigley heads up a kitchen that offers classic Italian-American dishes including lasagna, chicken marsala, and spaghetti and meatballs, alongside new-to-Tesoro appetizers such as arancini and meatball sliders, and several steak dishes. The pizza menu offers a greatly increased array of toppings, cheeses and sauces, and cold and hot subs in full and half sizes are also available. Behind the new granite-topped bar, in addition to wine and beer, a cocktail menu has some throwback concoctions including a Harvey Wallbanger (vodka, Galliano and orange juice) and a Godfather (scotch and amaretto), as well as a house-made Bloody Mary and an array of champagne cocktails. 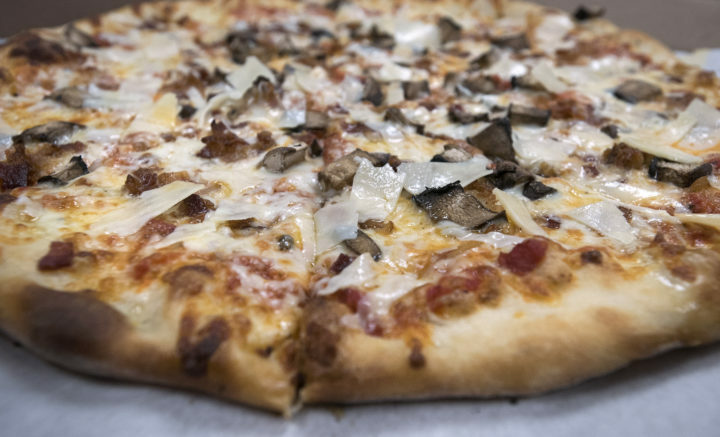 A pizza from Tesoro Restaurant and Pizzeria in Bangor, which reopened this week. Harvey said that, during the week, Tesoro will be open for lunch and dinner, from 11 a.m. to 10 p.m., and will initially offer delivery in downtown Bangor, though she expects to add delivery to Bangor and Brewer later this year. Thursdays, Fridays and Saturdays, the bar will be open late, and grab-and-go pizza slices will be available at both lunch and dinner. During the renovation process, Harvey said, pedestrians walking by would peek in the window to see how progress was coming along — or, in some cases, just walk in and say hello. “We’ve had people that have seen the entire process here, just from coming in and checking it out,” she said. Tesoro Italian Restaurant is located at 114 Harlow St. For more information, visit its Facebook page.